Our Jetboat Service Packages take all the mystery out of winter service and storage. With an extensive, itemized checklist, you’ll know what’s going to be done to your boat when it’s pulled in the fall and what will be completed when it splashes in the spring. If anything’s out of the ordinary, our technicians will notice right away and remedy the situation. We even offer a discount for those who sign up and pay for their package by September 18th. Our capacity for storage is nearly unlimited, but our space inside is not! Act now to ensure that your yacht is indoors in one of our heated facilities. 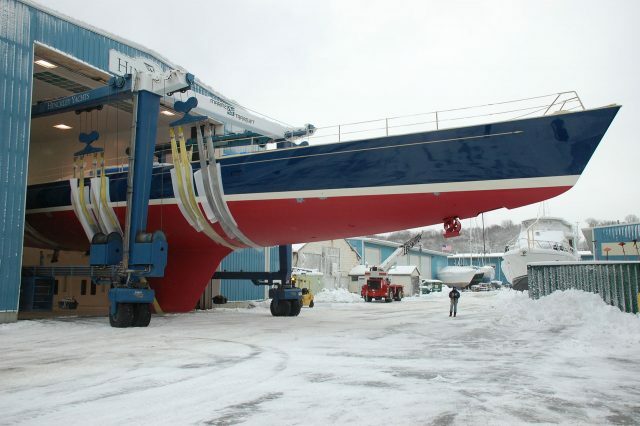 You’ll rest easier during the winter blizzards knowing your boat is out of the elements. And not only will your boat be ultra-secure, indoor storage is great for resale value. Buyers love to know a boat has been kept up well and stored indoors. Reserve now before space runs out. Your time is precious- let us worry about the pickup and drop off. For those of you who do your boating far from a Hinckley Service Yard—or are simply too busy—ask your service manager to arrange a fall pick up and spring drop off so your boat can spend the winter at HYS. 4. Still too far? Try our Authorized Service Centers! For those of you in the Great Lakes and on the West Coast, you can still get a near-Hinckley accommodations at one of our Authorized Service Centers. These nine yards have been vetted by Hinckley staff and we feel confident recommending them. Even if you’re not storing with us, we’re always here to help guide you. It’s all part of the Hinckley experience. The JetStick ® revolutionized the Hinckley helm and we kept on modernizing until we developed the JetStick II®. If your boat has a few seasons under its belt, it might be time to look into improvements all around. Our service managers can recommend possible upgrades to your vessel to achieve maximum speed and safety. Add AIS, or transom boarding handles, or upgrade your entertainment system. Whatever it is, if your boat is operating with out of date technology, winter at HYS is the time to correct it. « When It’s Time To Sell Your Boat, Here are Five Things You Should Do.